This triple bill from Birmingham Royal Ballet began with Arcadia, a new work from company dancer Ruth Brill, continued with Michael Corder’s take on Le baiser de la fée, and concluded with David Bintley’s Still life at the Penguin Café, a work whose title has intrigued me for years, although this was my first opportunity to see it. Arcadia told a story about the god Pan, half human, half animal, and his relations with those who share his world, both his fellow supernatural beings and his human subjects. The work opened beautifully thanks to atmospheric lighting by Peter Teigen, which shrouded a semi-crouching Pan in a mysterious haze. There was some nice, if not world-shattering choreography, especially for Pan who was danced by Brandon Lawrence. He leaped and bounded, and stretched his body as he swept his arms in all directions. But had I not read the program notes I would never have guessed that we were meant to be watching Pan in two moods, frustrated at first and then at peace with himself after the intervention of Selene, goddess of the moon. Perhaps the music, a composition by John Harle originally for violin, piano and soprano saxophone and specially orchestrated for this ballet, was partly the problem. While it was jazzy and made great listening, there didn’t seem to be enough variation in musical mood for Pan’s change of mood to be felt. But it was not helped by the fact that choreographically and dramaturgically that mood change didn’t happen. The dancers just danced on as if nothing had happened. 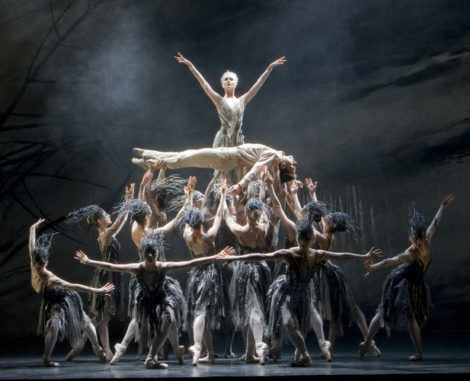 On the other hand, I thought Corder’s Baiser de la fée, danced to the Stravinsky score and based on Hans Christian Andersen’s The ice maiden, was beautifully structured so the story unfolded clearly and strongly, even given the complexities of the storyline. True, it was quite classical in format—it even had a form of grand pas de deux in the second scene when the Young Man (Lachlan Monaghan), whose fate was sealed when he was kissed as a baby by the Fairy (Jenna Roberts), dances with the bride as she prepares for the nuptials. For some that grand pas might make the work a little old-fashioned, but I loved the clarity of the piece and the way it moved inexorably to the finale when the Fairy claims the Young Man. And the designs by John F. Macfarlane were stunning in their decorative elements and in their use of colour to heighten both mood and the nature of the various characters. I was fascinated by Still life at the Penguin Café. It dates back to 1988 but its theme of issues surrounding endangered species is still as valid as it was back then. Is there still life for some species who today teeter on the brink of extinction, or are they still life as we understand a still life painting? However we may interpret that title (and there is room for both), Still life at the Penguin Café is a remarkable series of sketches, each one referring to a different species at risk, mostly hilarious on the surface, and always delightfully costumed (design by Hayden Griffin). I guess while the issue of endangered species is not to be mocked, there is room, as Bintley has done, to bring it to our attention in a light-hearted, episodic way. Full marks to the dancers who grabbed the opportunity to display their skills with special mention to Edivaldo Souza da Silva as the Southern Cape Zebra, not to mention those delightful penguin waiters. I am a big fan of triple bill programs. But it is rare to get a triple bill where every work delivers what media releases tell us it will be like. This program wasn’t an example of such rarity but there was a lot to enjoy.